LOURINHA, Portugal -- Eyes popping in astonishment, his mouth hanging mutely open, seven-year-old Joel approaches the four-metre-high monster and stands nose-to-nose with one of the deadliest killing machines the world has ever known. The full-scale Tyrannosaurus rex is just one of the prehistoric highlights on display at Portugal's self-proclaimed "dinosaur capital," a new theme park in one of the most fossil-rich regions in Europe. "We have 120 large-scale reproductions of 70 different species, spread over 10 hectares," Simao Mateus, Dino Park's scientific director told AFP. Although only recently opened, the park sits in a part of Portugal long famous among palaeontologists for its extraordinary array of fossilised remains. The nearby town of Lourinha, an hour's drive north of Lisbon, has been dinosaur-mad ever since the remains of a dozen of the creatures were discovered in the late 19th century. 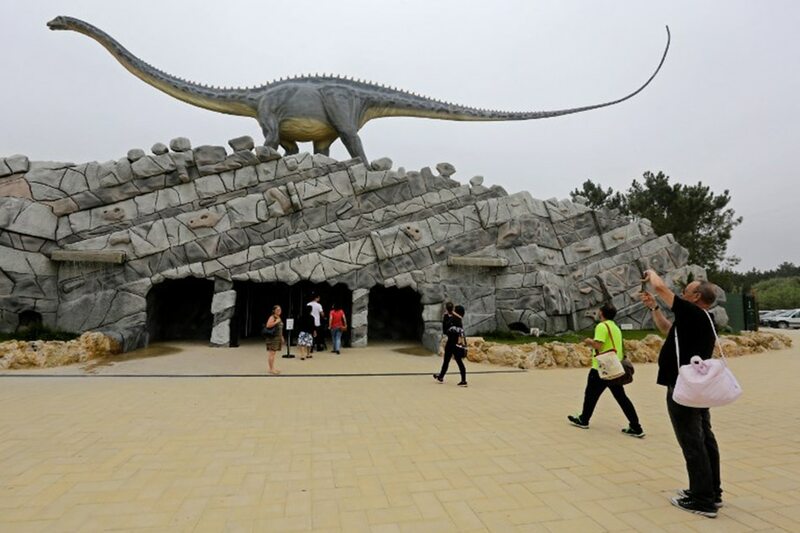 It already has a dinosaur museum and dinosaur statues in metal or resin can be seen on its roundabouts, while pavements are decorated with paintings of dinosaur footprints. "Lourinha is quite particular about its dinosaurs, so we should all enjoy" the new facility, Mateus said. Visitors to the park are greeted by the rearing neck of a giant model Supersaurus -- one of the largest dinosaur genera -- announcing a collection as impressive as anything else to be found in Europe. Imported from Germany, the resin statues are dotted throughout a forest route guiding budding palaeontologists through the eons when dinosaurs stalked the Earth. Pride of place goes to two models of dinosaurs actually discovered in the town. Lourinhasaurus was a sauropod -- an immense, four-legged herbivore similar to Brachiosaurus or Diplodocus -- that roamed the rainforests of western Laurasia around 150 million years ago. That gentle giant is not to be confused with Lourinhanosaurus, a sharp-fanged and crafty hunter the size of a crocodile that lived in roughly the same era as Lourinhasaurus. Mateus says interest in the park has started strong, with 175,000 visitors through the gates in the six months since opening, despite a prolonged period of poor weather. On this visit, to the backdrop of the roars and squawks of dinosaurs of all shapes and sizes, a gaggle of young schoolchildren gape up in awe at the T-rex, its huge jaws capable of gobbling each one in a single gulp. Other little ones cluster around a model Iguanodon -- a Cretaceous-era grazer -- though one boy keeps his distance from the reptile's giant spiky thumb. For park employee Filipa Pedro, who has been handing out stone blocks, hammers, chisels and other tools to this next generation of geologists, the experience offers children a glance of a long-lost part of the planet's past. "Children love dinosaurs, they are like these mysterious creatures that come from their dreams," she says. "Thanks to lots of cartoons and films on the subject, their knowledge is impressive. So this park is bound to please them."